The terminator of Venus (the line between day and night) as seen by the Venus Express spacecraft in May 2006. Venus may be closer to the sun than Earth, but its typically hellish atmosphere has a surprisingly cold layer that's chillier than any part of our own planet's atmosphere, a new study reveals. This region may be cool enough for carbon dioxide snow or ice to form, according to new observations from Europe's Venus Express satellite. This is surprising for a planet with normally oven-hot temperatures, scientists say. "The finding is very new and we still need to think about and understand what the implications will be," Håkan Svedhem, Venus Express project scientist at the European Space Agency, said in a statement today (Oct. 1). The strangely cold region lies about 78 miles (125 kilometers) above the planet's surface, and appears to host temperatures around minus 283 degrees Fahrenheit (minus 175 degrees Celsius). It's sandwiched between warmer layers on both sides. "It is special, as we do not see a similar temperature profile along the terminator in the atmospheres of Earth or Mars, which have different chemical compositions and temperature conditions," Svedhem said. Venus' atmosphere is full of carbon dioxide, which might change phase when it enters this cold layer. "Since the temperature at some heights dips below the freezing temperature of carbon dioxide, we suspect that carbon dioxide ice might form there," said Arnaud Mahieux of the Belgian Institute for Space Aeronomy, who is lead author of the paper reporting the results in the Journal of Geophysical Research. If there is ice or snow made of carbon dioxide there, it should be very reflective, creating especially bright spots on Venus. 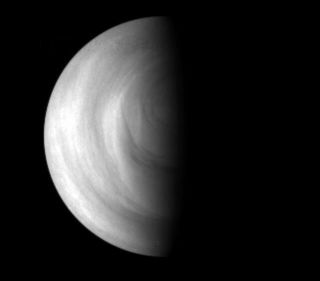 "Although Venus Express indeed occasionally observes very bright regions in the Venusian atmosphere that could be explained by ice, they could also be caused by other atmospheric disturbances, so we need to be cautious," Mahieux said. The 220 million Euro ($283.7 million) Venus Express mission launched in November 2005, and arrived at the second planet from the sun in April 2006. Since then, the probe has been orbiting Venus to learn more about the world often called the closest twin Earth has in the solar system. The spacecraft is slated to continue operating through at least 2014.